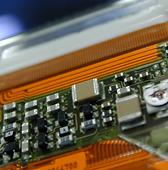 Product Line-up | Nippon Polytech Corp.
We, Nippon Polytech, have been convinced that a new technology in the electronic circuit field is always innovated by a new process technology with progressive electronic materials. 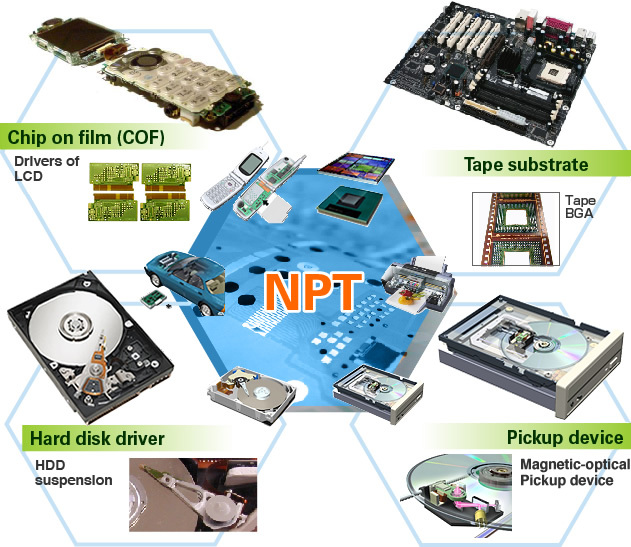 Today, Micro-Electronics being progress in the world, we expect that the solder mask materials developed by Nippon Polytech have been contributed toward much more advanced accuracy and reliability in the circuit board field. Nippon Polytech, as a technology group with flexible thought, has promised to develop a new solder mask material which must be useful for the growth of the technology in the field. In fact, we are still facing on the customers satisfactions. Photo-image, alkaline developed type solder mask. These grades have been applied for the products such as suspension in HDD, drivers of FPD, circuit board of Printer, and T-BGA, COF, TAB, with fine patterned circuit board since 1994. The FPC used by these grades shows an excellent flatness, so that the grade exercises the performance in solving a warpage problem of FPC. And it is expected that a cracking problem during manufacturing FPC is reduced by reason of showing excellent flexibility right after UV exposure. NPR-5, curable typed solder mask, consisting of epoxy resin is suitable for FPC. These grades withstand hard crease of FPC, and then enable to maintain the flatness of FPC. The UV radiation process and developing process are not required. This grade shows an excellent adaptability to Sn plated COF by reason of lower curing temperature and possess several excellent characteristics of electrical properties. In addition, this grade exercises an excellent flexibility at the processing in the fabrication company and accommodates to Halogen free requirement from the customer. Copyright©2007 Nippon Polytech Corp.All Rights Reserved.